EVENT DATE: Sunday, December 8, 1:00-5:00 p.m.
Design, build, and paint your very own Little Free Library box to install in your yard, and ­become a ­community-building catalyst in your neighborhood! Boxes are popping up all over town, even in front of offices and apartment buildings. We’ll be constructing libraries using recycled ­materials whenever possible (bring some if you have them!) and working from a Little Free Library template. We can also help you with something more free-form if that’s your style. 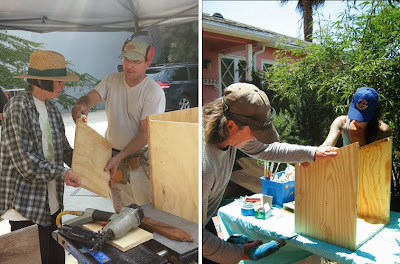 It’s a great way to learn basic woodworking skills from our friendly handy­people while making new friends. And if you happen to be one of those handy folks, please bring your tools. Join us for this fun day of ­creativity and community ­connection—just in time for the holidays! Curious about the nationwide project? Visit LittleFreeLibrary.org.